Hello everyone! My name is YanickaHachez. I am a professional technical drafter for 15 years, but I got interested in quilting since way back. 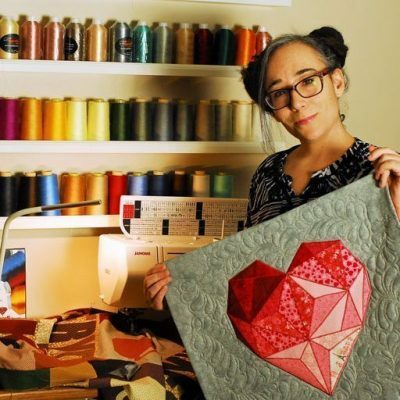 Already, when my first child was born, I was home alone in the Canadian North, listening to Eleanor Burns’ PBS “Quilt in a Day” show: that’s how I started quilting. And so I created quite a few traditional quilts these daysin my spare time. More recently, I realized my favorite part of quilting was letting my creativity flow instead of following other designer’s patterns. Besides, for me, traditional quilts made of assembling hundreds of blocs rarely tell a story. I am motivated by trying new things, crazy colors combinations, shapes and textures! I want my quilts to have an impact. I started a blog to show my creations and quickly, people started asking for help on how they could reproduce my quilts. At this point, I realized I had the perfect professional training as a technical drafter to quickly create patterns on Autocad and Illustrator that everyone could easily follow. To help communicate how to reproduce my creations, I developed a new technique I called the “fractured image”, in which complex images are broken down into shapes, traced using freezer paper, and assembled back. I also explored appliqué, 3D textures and textile paints. I would never have been able to succeed without my amazing husband’s unconditional support! Finally, fate made me meet Edith Choiniere at the last Quilt Show in Montreal. It is also there that I met MonFil.ca: what a find! Their quilting thread is strong and beautiful, and won’t break or leave fibers everywhere like other brands. Edith decided to mentor me and helped me share my creations, getting me organized for the next great quilt show in Mississauga, while MonFIl became our sponsor. Should you pass by Mississauga next June come chat with us at our booth!